Have you had more than enough of English casino’s? That problem is solved for you by Oranje Casino Live Casino. As soon as you decide to play at Oranje Casino Live Casino you will get a warm Dutch welcome. As Oranje is Dutch for Orange, it looks like you are in a total orange environment, where you can play also at orange tables. 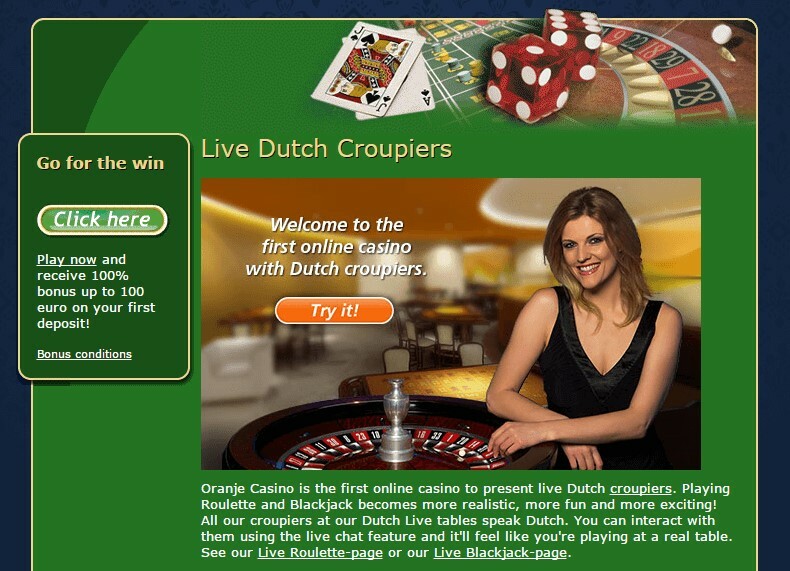 Oranje Casino Live Casino can be typified by her simplicity and Dutch Character. Choose one of the two live casino’s and enjoy the enormous live offer! Visit Oranje Casino Live Casino Directly! Oranje Casino has a slightly weird home page. In the first instance you will get the idea that you have landed on a registration page and will visit the real website after this. But nothing could be less true, you are directly on the website of Oranje Casino. 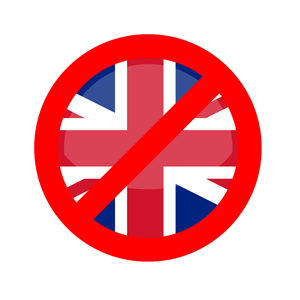 Pale colours do not make the website appealing and do not invite to play. The logo could also be uplifted. The home page does not appeal but also lacks a professional appearance. There is no banner and in the middle a green block with text is visible. The casino is promoted in this, which is a good thing. Because of the simple lay-out it is not hard to find your way on the website of Oranje Casino Live Casino. The registration and log in buttons are better visible than the logo and other aspects of the website itself. A simple main menu is visible where the link to home, casino, live casino, promotions, mobile devices and charities have been included. Should you have urgent questions, than there is no live chat button on the home page to link you directly to the live chat option. If you visit the help page afterwards, you will soon find out that the casino does not even have one chat option. That is a waste of course. A prominent feature when you land on the live casino page is that there is a lot of information available in writing. It is an advantage that Oranje Casino wants to inform her players first about the live casino and wants to give an impression by pictures of certain live games. It lacks a complete view of the available games in the casino. By clicking the “play now”buttons a pop up-screen of the online casino appears. A funny detail is that you will be overwhelmed here by real casino background noises. Next you will have to select this menu again to select one of the live casino games In this view a difference is made between standard live games and the HD version of live Roulette. So Oranje Casino uses two different live casino’s. Netent Casino and Evolution Gaming Casino. 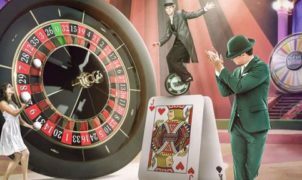 Should you choose the Live Roulette HD version, you will then end up in the menu of Netent live casino where you can also choose for a Live Blackjack game or a VIP version. By choosing one of the other games, amongst others Live Blackjack, Live Roulette, Live Baccarat, Live Casino Hold’em from the view, you will be sent to the menu of Evolution Gaming. Here you have the chance to play at different tables of Oranje Casino itself. Both live casino’s are open 24 hours a day. The environment you are playing in will be totally depended of which casino you choose and which game version you decide to play. Through the Evolution gaming live casino you can also take a seat at on of the Oranje Casino tables. At these tables the main language will be English and the game environment will be different from other game versions. The game tables from Oranje Casino are of course orange when you play Live Blackjack, and the walls and floor will be also orange. Should you wish to play at another table of Evolution gaming, then this will be at a green play table in an environment with green walls with wood borders. In every case there will be other live dealers around your table and this is noticeable for sure. When you choose a game in a different language (e.g Italian or German) or you choose the French or London version of the game, than you will be seated at a table in a separate room and the interior will be totally dependent on the version. Would you rather choose a play table in the Netent live casino, than you will be seated at a green play table and with the standard versions the wall will have a dark colour so the wheel and table will stand out. Should you choose a different version, for instance the VIP version of one of the games, then you will end up in a royal game environment (e.g a pre-programmed ballroom). Also the features of the live dealers will be different per casino and game version. In both Netent and Evolution gaming live casino, only English speaking live dealers will be available, but you can however choose between a male and a female dealer. In the Evolution gaming casino the female live dealers are dressed during the Live Roulette mostly in a golden dress and during Blackjack in a black dress. In NetEnt live casino, the clothing will change entirely per game version. The standard versions will be played here with female dealers in a black dress, but should you choose a game with immersive view, than this will be different. At the VIP table a large contrast will be visible. The female live dealers are wearing a classic golden dress and have classic features. Live Roulette can not be missed in the game offer and surely it does not at these live casino’s. Remarkable is that Evolution gaming has larger tables available to play Live Roulette. The different tables also have limited bet limits. The biggest difference between the two live casino’s in case of Live Roulette is in the possibilities and the environment. Namely, Evolution gaming Live Roulette has three different perspectives you can choose from. This means you can play the game from a standard view, a 3D view, or an immersive view. The last refers to the changing images from the wheel, the dealer or both, which will pass by on your screen. While NetEnt only has one possibility for this, it is immediately noticeable that the environment you play in is much quieter and other live dealers are not within view nor are they easy to hear. Large VIP tables are available. It is striking that Evolution gaming has a much larger amount of Live Blackjack tables available. There are a lot of standard Live Blackjack tables (A to I) where can be played with different limits, but also a few VIP-tables and even a Party Live Blackjack table. For NetEnt goes that the number of tables is limited and there is less choice of different bet limits. Also during playing Live Blackjack, the environment of NetEnt Casino will be far more quiet than when you play in the Evolution Gaming Casino. Register now at Oranje Casino and receive up to 100 Euro! 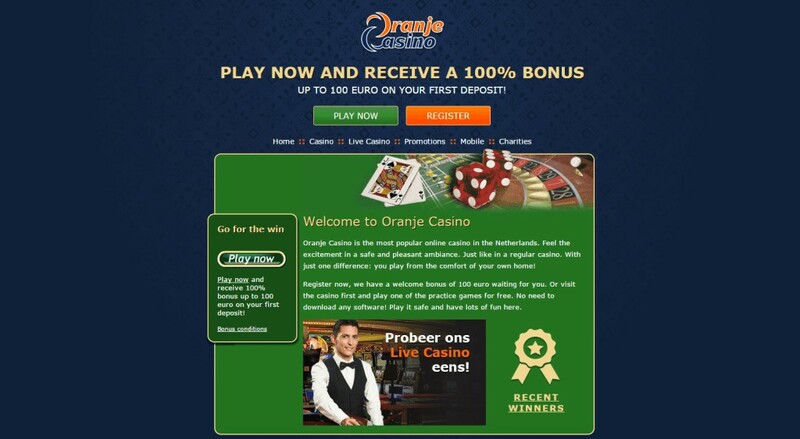 Oranje Casino pleasures her new players with a welcome bonus of 100% up to 100 Euro. In case you make your first deposit, you can choose to accept this bonus. Please follow the conditions related to this. At Oranje Casino Live Casino you only have to play round for 15 times, however it applies that during the same period, a month, no other bonuses can be accepted. After 90 days the bonus amount will automatically be removed from your account. On top of the welcome bonus, Oranje Casino Live Casino has regular other promotions in store for her members. Unfortunately the promotion page is not the most inviting page and promotions will not stand out. One of their standard promotions is the free trial of the casino. This way new players get a chance to discover and learn. There is also the opportunity to get extra profit while playing the online casino. Sometimes Oranje Casino offers fantastic promotions. For instance during the European Cup Match 2016 and the World Cup Match 2014 there was a lot to do. During the World Cup Match 2014 there was of course a lot of orange news and this was picked up by fun promotions around the Dutch soccer team. Both display quality and sound quality of the game depend on the live casino you decide to play in. Should you choose Netent’s live casino, then you will end up in a quiet environment where you will see a single table on your screen. Here you can enjoy the HD-quality without being disturbed by background noise or other noisy live dealers. You can hear a quiet background music during the game. Unfortunately the live casino of Evolution gaming does not offer this. Should you play in the standard casino where other live dealers are present, they will regularly be disturbed by them as you are in a noisy environment. The display quality depends on the game you play. Strange enough the display quality of the Live Blackjack games is relatively lower than when you decide to play Live Roulette. The general play offer of Oranje Casino is slightly more limited compared to other online casino’s. Once you have entered the online casino, you will have a choice of live games, roulette, blackjack, poker or certain slots. Moreover it is not possible to play baccarat or scratch card games. A predominant feature is that there are no jackpot games available or displayed so badly that they cannot be found. While the general offer is small, you will not lack anything in the live casino, where all games of two different casino’s are available for you. Should you have quick or urgent questions and you do not want to wait for the answer for hours then it is only possible to call to Oranje Casino. This is because they do not have a live chat possibility. They also have an e-mail address which is available 24 hours a day. In case of a simple question and you do not want to make phone costs, please take a look at the frequently asked questions page. Receiving payment is easily arranged through the payment button and already possible from 10 Euro! You only have to leave your details to start the procedure. Within days, depending on the payment method, you will receive the money in your account. Players can’t access this site from the UK. We recommend 888 Casino instead. 24/7 Live Chat support, Email, VIP support. 10 Free Spins from Paris Hilton at BGO!